I've been a railway fan since taking that first exciting journey on Alaska's Sawtooth Range, from Whitehorse, Yukon to Skagway at five years of age. On South Africa's Rovos Rail, and the Marrakech express, I felt a similar thrill. Editor's note: One of the highlights of our career in publishing was a visit to Railfair in Sacramento. It was held at the California State Railroad Museum and was certainly an event to remember. We hope Railfair continues. California State Parks, with the support of the California State Railroad Museum Foundation, continues to make progress toward placing the Railroad Museum's next phase in the historic Southern Pacific Sacramento Shops complex. Located adjacent to downtown Sacramento, the Shops are one of North America's most important industrial heritage sites. Proposed for the site is the Railroad Technology Museum (RTM), a major expansion of the California State Railroad Museum. In late 1999, the Museum secured a lease from Union Pacific Railroad on the complex's two main structures, the Boiler Shop and Erecting Shop. These cavernous structures both date from the days when steam locomotives were built and repaired at the Sacramento Shops. Portions of the massive, brick Erecting Shop date from 1869 and SP predecessor Central Pacific Railroad (CP). As such, the Southern Pacific Sacramento Shops include the only surviving CP structures standing when America's first transcontinental railroad was completed. In early 2000, the Museum completed moving its restoration facilities into the former Boiler Shop. In order to fully occupy the Erecting Shop with full-sized locomotives and cars, however, reconstruction of the Transfer Table&emdash;a bridge-like structure that allows access to the many "work bays" within the Erecting Shop&emdash;has been essential. Construction of the Transfer Table began during mid-2001, and it was completed in spring 2003. This $500,000 project has been funded through State Parks Deferred Maintenance allocations and a major fundraising campaign conducted by the CSRM Foundation in 2000-2001. The completed Transfer Table now allows access to the Erecting Shop for the Museum's collection of historic railroad locomotives and cars. Stored outside for years, these historic items&emdash;many awaiting restoration&emdash;are considered a top priority for conservation by the Museum. Many of the locomotives and cars will become exhibits within the new Railroad Technology Museum, showcasing over a century of technological development and innovation in the railroad industry. Restoration and maintenance activities for the Museum's collection of full-sized locomotives and cars have been conducted since 2000 in the complex's Boiler Shop. In December 2002, the latest project&emdash;refurbishment of a 1920s vintage coach with a Missouri-Kansas-Texas Railroad heritage for operation on the Museum's excursion railroad, the Sacramento Southern&emdash;was completed at the facility. Construction of the Transfer Table has also taken place in the complex's Boiler Shop, given its proximity to necessary tools and expertise. Ongoing maintenance of the Museum's operating steam and diesel locomotives takes place in the Boiler Shop, along with maintenance of the Museum's coaches and converted freight cars which regularly carry school groups in spring and fall, and families during the summer. The necessary support systems for the Museum's operating railroad&emdash;track materials, specialized machinery, and wayside and at-grade crossing signals&emdash;are built and maintained here as well. Also under way is a railcar conservation project for another State Park, Colonel Allensworth State Historic Park, attesting to the Shops' ability to provide skills and tooling for a variety of activities. 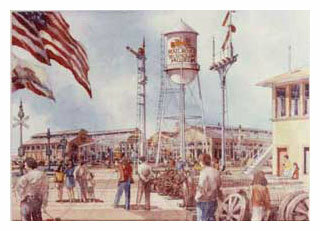 The Railroad Technology Museum (RTM) was envisioned in the very first planning documents created to guide development of the California State Railroad Museum. Planning for the RTM began in the mid-1980s, following completion of CSRM's flagship, the 100,000 square-foot Railroad History Museum in Old Sacramento. Intended to complement that facility, the RTM would convert a portion of the 44-acre historic Southern Pacific Sacramento Shops site into a dynamic cultural attraction. The ambitious project would increase the drawing power of Sacramento as a cultural and tourism destination, and provide a unique focal point for surrounding Downtown Railyards and waterfront redevelopment efforts. Originally envisioned at a waterfront location south of Old Sacramento, the Railroad Technology Museum is much better suited for development in the former Southern Pacific Sacramento Shops. This adaptive yet historic re-use project would preserve the very structures that best commemorate and celebrate the history and technology of railroading in California. It would benefit the Museum's commercial and residential neighbors&emdash;including Old Sacramento, the Union Pacific Railroad, and the City and County of Sacramento&emdash;and help spur redevelopment of the Railyards in a positive, historically appropriate manner. The spacious railroad shop buildings would house CSRM's collection of historic locomotives and railroad cars, plus formal museum exhibit galleries interpreting railroad engineering and technology. Children would have the opportunity to explore fundamental physics and engineering principles through hands-on, interactive exhibits. Through the use of sectioned locomotives, scale models, interactive displays, oral histories, and other interpretive techniques, the Museum and its staff would educate the public about steam and diesel locomotion, track structure design and wheel interface, the importance of the Shops and its labor force in the development of Sacramento, and the relevance of railroads in helping meet the transportation challenges of the future for California and the United States. Another significant aspect of the Railroad Technology Museum is the opportunity for the public to regularly view ongoing restoration work. Previously, this important aspect of the California State Railroad Museum's work has been conducted offsite, not accessible to the public. The ability to watch artisans working "real time" on steam and diesel locomotives, wooden and steel railroad cars, and other types of projects has significant informational and educational value. The facility could easily support curriculum-based educational programs for teenagers and young adults. Vocational educational programs could be established in conjunction with ongoing renovation work, offering new skills training and development. To this end, the Sacramento City Council in late 1999 voted unanimously in support of the concept of locating the Railroad Technology Museum in the former Southern Pacific Sacramento Shops. The Railroad Technology Museum portion of the project is estimated to cost approximately $25 million. Development of other existing structures within the historic Shops complex are being discussed with the Union Pacific Railroad and railyard developers, as well as other cultural organizations potentially interested in the site. The Railroad Technology Museum represents a unique opportunity to secure public stewardship of the oldest (and for a time, largest) industrial complex west of the Mississippi River, which for 80 years was also the Central Valley's largest employer. It would create an urban museum complex contiguous with the Old Sacramento Historic District, itself internationally known, and its location and appeal would help foster surrounding transit-oriented development. The Railroad Technology Museum would benefit the community in numerous ways. As the region's largest employer for decades, the Southern Pacific Sacramento Shops fundamentally influenced the development, concentration, and growth of many ethnic groups in Sacramento and the Central Valley. Ethnic diversity and community pride will be demonstrated through ongoing study and exhibition focused on the thousands of workers once employed in the Shops. The California State Railroad Museum is uniquely equipped to foster the preservation and appreciation of California's rich railroading heritage. The Museum's primary mission is to preserve key railroad heritage resources, and make them available to the widest possible audience. Assisting the Museum (a unit of California State Parks) in its mission is the California State Railroad Museum Foundation, a non-profit organization chartered to raise and manage funds on behalf of the Museum and to provide a variety of additional support services. Operated by California State Parks with assistance from the non-profit CSRM Foundation, the California State Railroad Museum is open daily from 10 a.m. to 5 p.m. except Thanksgiving, Christmas, and New Year's Day. Widely regarded as North America's finest and most-visited railroad museum, the complex of facilities includes the 100,000-square foot Museum of Railroad History plus the reconstructed Central Pacific Railroad Passenger Station and Freight Depot, 1849 Eagle Theatre, and Big Four and Dingley Spice Mill buildings in Old Sacramento State Historic Park.